Back by popular demand (okay, a couple of you were kind enough to say you’d like this to be a regular thing), is another helping of happiness. Here’s a snippet of what’s been making me smile this week. They say if life gives you lemons, make lemonade. Well that’s how I feel about our good old weather system. It’s been wet and cold but at least it gives me the perfect excuse to wear my new wellies. I quite liked that cheeky wind whipping up my skirt too! I’ve also had the perfect excuse to stay indoors and do some crafting. Sewing Bea’s Christmas stocking reminded me how therapeutic making stuff is. It focuses my mind and slows me down. I’ve made myself a little promise to try to do this at least once a week. This little Singer sewing machine necklace was a birthday present from an old friend of mine. I’m going down to London to visit her this weekend and really looking forward to wearing this on Saturday night when we have cocktails and a big catch up. I know it’s depressing when it starts to get dark at 4 o’clock but I quite like the fact that I can begin to draw the curtains, put on the low lights and cosy up for the night. And it means we can use this old lamp of ours which we finally got out of storage. Switching it on at dusk each night this week has cheered me up. This man, my mister. He’s been working some crazing hours this week; burning the midnight oil and then up with the larks the next day. And he still insists on helping me with the kids. He really is Superman you know. Well, he’s a man and he’s super. To me, anyway. I’m going to tell him how much I appreciate him. I suggest you do the same with your loved ones. Hope you’ve had a happy week too and if you’ve blogged about your own ‘Happy List’ then please do leave a linky in the comments section so we can all have a read. Come in, sit down, slip your shoes off. We’ve made it to the end of another week. And. What. A. Week. While I’ve been feeling better (thank you very much), I’ve been playing nursemaid to my little girl, who’s had *that* sickness bug. But it’s never all bad, so I’ve written down another Happy List (could this be a regular blog feature I wonder?). Here are the little things, for which I’m thankful this week. After all, often it’s the small things that are really the big things (depending on which way round you’ve got your telescope). Health. Seeing a usually bouncy toddler go downhill fast is always a reminder of how lucky we all are to have our health (she’s right as rain now, thankfully). Making my first Christmas decoration of the year (paper chains from Homemaker magazine). Yep, I’m starting slowly! Making the most of the briefest rays of sunshine. Fresh air and vitamins are our friends. Writing thank you letters. I hate that feeling when you haven’t got around to thanking someone properly. It niggles me. A trip to the cinema to see Bond. I can’t remember the last time me and the mister had a date. We felt like a couple of teenagers with our naughty drinks in a can. This week has been a funny old kettle of fish. I’ve been feeling a bit blue, for no real reason. Sometimes life is like that. You can be bobbing along merrily and then someone suddenly turns the music off and everything turns to grey scale (or is that just the weather?). Anyway, inspired by one of my favourite bloggers Lisa (check out her regular feature 5 Positive Things To Do This Week ) I decided to write down at least one good thing each day, for which I should be thankful. 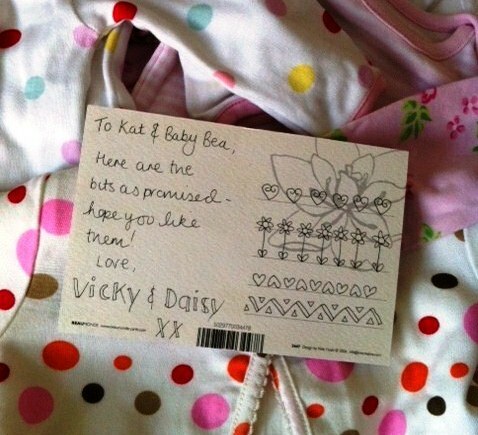 Day 1) Opening a parcel of beautiful baby clothes, passed on to me from the lovely Vicky. 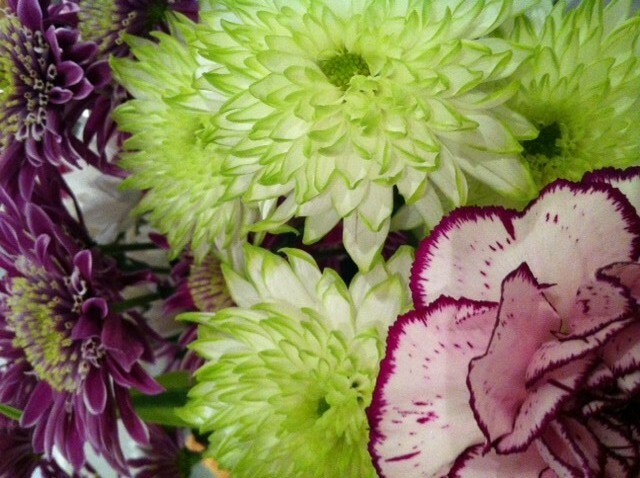 Day 2) Getting a bunch of surprise flowers from the mister (bless him, he’s a keeper). Day 3) Discovering a newly-opened cafe in town (Yorkshire meets Scandinavia – yum) and treating myself to a cheeky lunch there. 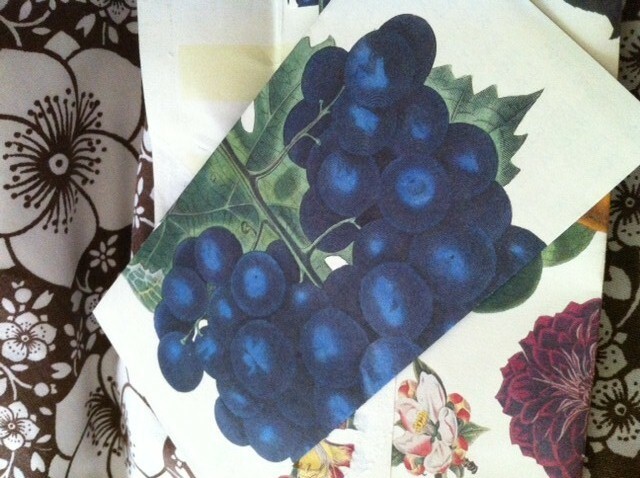 Day 4) Receiving a lovely hand-written letter (on scented notepaper – mmm) from another equally lovely bloggy pal Molly. 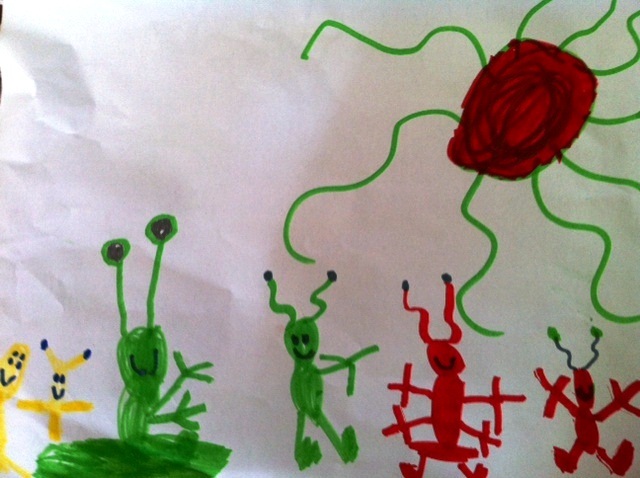 Day 5) Being given a picture of aliens drawn by my six year old Charlie – how can I feel sad when they look so happy? So, when you look at it like that, I had a pretty great week really.